OTTAWA (January 19, 2017) The Canadian Alliance on Mental Illness and Mental Health (CAMIMH) would like everyone to take a moment on January 25th to talk, text and join in on social media in support of Bell Let’s Talk Day and mental health in Canada. As the national voice for 17 health associations, CAMIMH hopes to spread awareness about the realities of mental illness and also to eliminate the stigma associated with it. This year’s campaign highlights how mental illness has an impact on everyone. 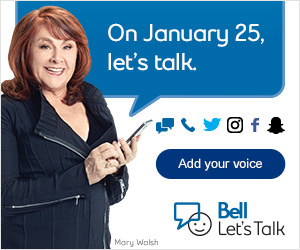 CAMIMH encourages all Canadians to join the conversation and hear Bell Let’s Talk national spokesperson Clara Hughes and the team talk about the impact mental illness has on all of our lives. CAMIMH is proud to work closely with Bell Let’s Talk. Their initiatives have supported CAMIMH’s Champions of Mental Health Awards and Faces of Mental Illness campaigns for the past five years. CAMIMH would like to help Bell Let’s Talk beat 2016’s record of 125.9 million messages which grew Bell Let’s Talk funding for mental health initiatives around Canada by $6,295,764.75. How can you participate on Bell Let’s Talk Day?